The time: 1880. The place: Lockwood’s Opera House over the dry goods store in the little prairie town of Northfield, Minnesota. 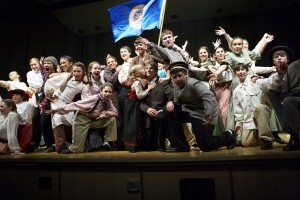 Share laughter and tears with the settlers and get a taste of entertainment in early opera houses. Includes some of Minnesota’s earliest music, arranged by Minnesota composer Daniel Kallman. Large cast musical appropriate for middle school, high school, or community theater. Unison and 2-part voices, piano, opt. violin. Available in one-act or two-act versions. Duration: 60 or 90 minutes. Listen to music samples and view PDF’s of music. Lockwood’s Brightest Stars was premiered on April 11, 2008 in Northfield, Minnesota, by a cast of students from the Northfield Middle School under the direction of Rachel Haider. The project was funded in part by a Southeast Minnesota Arts Council Artist-in-the-Schools Grant and a Minnesota Sesquicentennial Grant from the State of Minnesota. The script was written to offer many interesting roles (rather than just a few lead roles), with large chorus numbers, solos, non-singing roles, and dance. The script was not simplified for the middle-schoolers so, while it is very accessible to this age level, it is very appropriate for adults or mixed ages. Minnesota, Lily of the West (1868) by Will Hill (Rushford, MN). Putting On the Style (a popular song of the 1880’s). Under Her Window, sung to the tune of Acker Waltz (1861) by George Siebert, Minnesota’s first resident composer. Bright Things Can Never Die by the Hutchinson Family Singers, famous throughout the country in the 19th century, and founders of the town of Hutchinson, Minnesota. Fjariln vingad syns pa Haga (O’er the misty park of Haga) by Carl Michael Bellman, beloved composer in 19th century Sweden and Swedish America. My Shining Light, adapted from L’Etoile du Nord (Star of the North) March (1863) written for piano by Frank Wood of St. Paul, who was a band director, piano teacher, and Minnesota’s first song writer. Fairy Dell Polka (1878) by Alfred. M. Shuey (Minnesota organist and composer). Winona Schottische (1866) by George Washington Lovejoy (Rochester, MN). Minesota [sic] March (1851) by George N. Allen of Cincinnati. First published sheet music with Minnesota (published “Minesota”) in the title. Read more, including playwright’s program notes.